On a gray morning late last March, eighteen Eugene Natural History Society folks met in a gravel lot next to Highway 101. 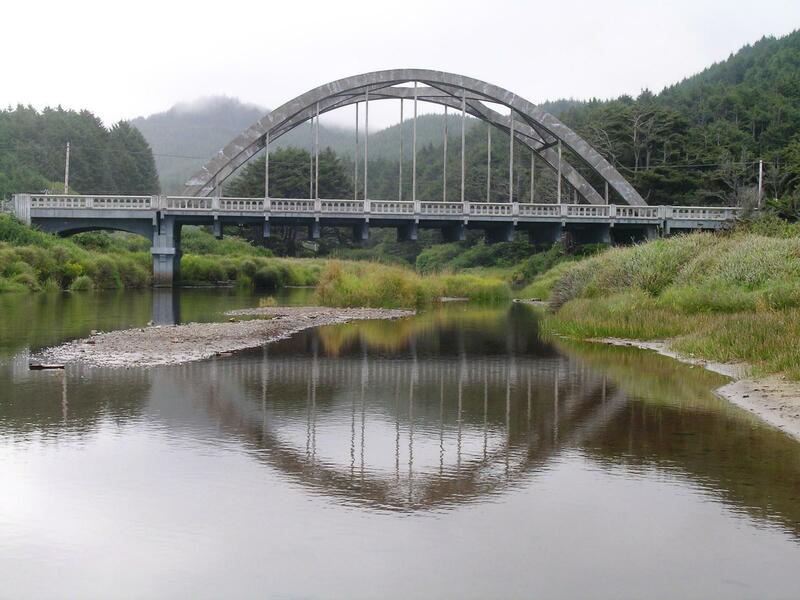 The steely water of Tenmile Creek flowed under an arched bridge and across a sandy beach into the Pacific Ocean, completing its short journey from the conifer ridges rising in the east. The wind was also flowing, pressing in from a line of dark clouds on the southwest horizon. The rain would come. Our mission that morning was straightforward: we would walk one mile of beach from the mouth of Tenmile Creek northward to Bray’s Point and remove every piece of human-made junk that we could find. Our cleanup was longtime ENHS member Evelyn McConnaughy’s legacy to us. Eve had adopted this beach and had for decades assiduously picked up the garbage. Legacy has several meanings, but in this case the best fit is “something transmitted by or received from an ancestor or predecessor or from the past.” Although there is no obvious etymological connection, legacy seems closely related to the musical term legato, “in a smooth, flowing manner, without breaks between notes.” Although Eve had left us, we were here to continue the hands-on environmental activism that we had received from her in a smooth, flowing manner, without breaks. We were here because as long as there are willing hands that knew Eve’s hands and who know other hands, this beach will be cleaned. From the parking lot we followed a trail through shrubs and twisted shore pine to the beach, then traversed the north side of Tenmile Creek. The high tide line was a tangled mess of drift logs and dry hollow canes from invasive Japanese knotweed now choking the creek just upstream. We focused on the largest pieces of garbage—dismantled chunks of Styrofoam from coolers and packing crates and disposable water bottles. Plastics have been called a slow motion toxic spill. All those megatons of polymers made from hydrocarbons can only be reused or ultimately poked into holes in the earth to settle in for the long haul. This is a legacy, too. Perhaps the final incineration of all this garbage will come when Earth no longer resists the gravitational pull of the Sun and is swallowed. Those of us able to cover longer distances strode northward along the blond sand toward Bray’s Point. The rain began in earnest, driven by a stiff breeze. Fortunately it was hitting us from behind. I began to imagine all of the trash in the entire Pacific, the largest ocean in the world. I considered our small crew, this small stretch of beach, and our puny garbage bags. Futility rolled in with the surf, and I felt myself slipping over that gray horizon into despair. I pretended that I was the only one who felt this way and held hopelessness at arms length by reaching for a piece flat orange plastic caught between two drift logs. I wondered how many small fragments this large piece might have become that could potentially be eaten by rockfish or salmon or seabirds. Time ran short and our group returned south before reaching Bray’s Point. Because we had already picked over the tidewrack high on the beach, I shifted over to the flat strand near the surf, following a thin wavering line composed of small bits of wood, seaweed, and plastic. The plastic chips were about the size of my thumbnail, colorful confetti incongruous against the smooth, shiny sand. By running my hand lightly across the wet surface, I could corral many of the tiny pieces at once. Scooping them up with a little sand, I chucked them into my trash bag. My mind began another walkabout, maybe more of a swim, out to the Great Pacific Garbage Patch. In the North Pacific Gyre, wind and currents have increased the concentration of pelagic plastics and other debris. Estimates of the magnitude of the Garbage Patch vary wildly, but all agree that it’s large, ranging from the size of Texas to twice the area of the continental United States. The Garbage Patch is not a raft of floating debris that can be seen from the surface. Rather, it is composed of a high concentration of waterborne bits like the ones I was scraping off the beach. The language describing the Garbage Patch troubles me. The National Oceanic and Atmospheric Administration website seems bent on dismissing any sensationalism around this suspended plastic mess. They point out that part of the uncertainty over the size of the Patch is because the density of pelagic plastics that would distinguish Garbage Patch from Not Garbage Patch has not been established. They say the impact on wildlife is unknown. This is semantic nonsense. It is language that continues the myth that to have meaning biology must be corralled into black or white, zero or one, this or that. At times I wonder whose side NOAA is on. Phrases like “we don’t know” and “estimates are imprecise” are the language of mollification. Instead watch the short film “MIDWAY, A Message from the Gyre,” a documentary by Chris Jordan showing soaring gannets interspersed with clips of decomposing avian corpses, feathers and bones encircling piles of plastic crap ingested by each bird over its short life. Yes, we do know. We know it regardless of whether that knowledge is too horrifying to face. At each stop along the strand that is Eve’s mile I was able to scoop together roughly the same amount of plastic ingested by one or two of those unfortunate seabirds. The wind and rain continued, and we were now taking it directly in the face. For a moment the images of dead birds and the immensity of the plastics problem rolled over me, a sneaker wave of despair. But despair simply won’t do. One person at the memorial service had once asked Eve how she managed to remain so cheerful when the news was always so bad. Eve broke open her winning smile and said “because there is always so much to do.” Eve taught us to stop overthinking things. She explained with her actions that action matters. Being an environmental activist does not require that we chain ourselves to a bulldozer. We must simply engage in correct action, perhaps many small actions. Together. We need to show up and pick up litter on a beach. We need to believe that for our efforts the beach will be a better place and that all those who thanked us that day were genuine in their appreciation. Despair simply won’t do. This is Eve’s legacy.